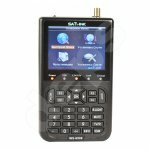 A battery powered hand held Digital Satellite alignment meter demodulating DVB-S Signal. It’s very convenient for installers to catch quick and accurate alignment for Antenna to the best position with microprocessor controller, reliable and stable performance. The given device was designed for tuning the satellite antennas to a certain satellite.